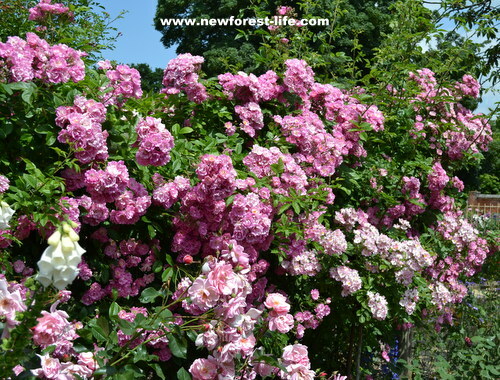 We've just visited the beautiful Mottisfont Abbey National Trust rose garden near Romsey. It's easy to visit if you are holidaying in the New Forest. The rose garden and the walled garden are truly stunning. My tip is to visit as early as possible especially if there is still a bit of overnight dew about - the scents of 700 rose varieties is breathtaking. The rose garden is within 3 walled gardens. 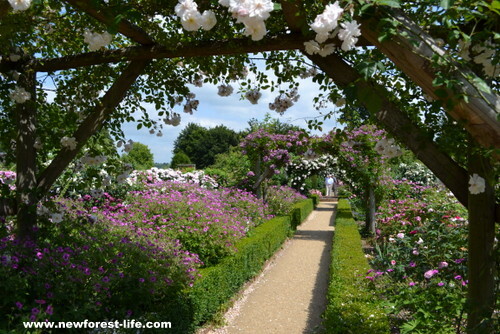 Here you can see just one of the beautiful paths which divide the roses on display. Mixed planting means your can admire peonies and campanulars as your gaze lifts up to the arches of roses above your head. The National Trust have really made this a stunning rose garden to visit. You enter through one part of the walled garden where roses are grown up vertical poles. 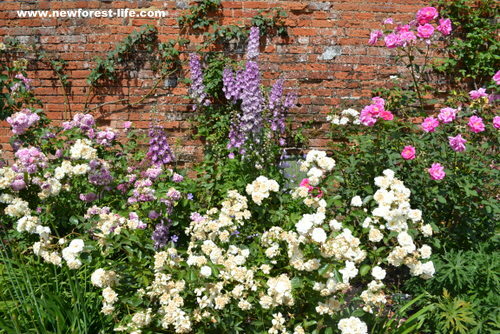 Then when you enter the outer wall you are met by borders full of all types of cottage garden flowers, with roses interspersed amongst them too. Once in the heart of the inner walled garden you see this wonderful seating area where roses are grown over metal poles - one of the helpful and charming gardeners told us this was the first year all the trellis poles had successfully been totally covered by stunning displays of roses. It was hard to take this photo without including legs etc of people who were sitting in the circle of roses enjoying all their splendour. And the sun decided to go in as I took this shot! 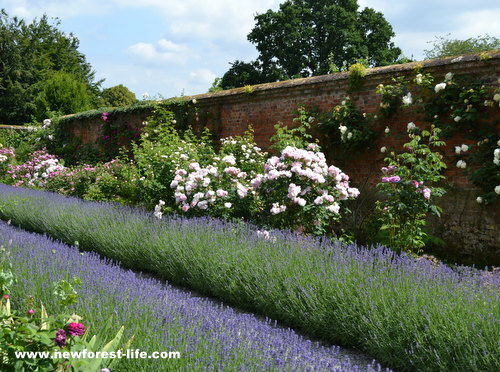 Many of the paths in the rose garden are edged by long swathes of lavender. They set the roses off perfectly. At one stage this in this National Trust rose garden we found we were yabbering away as we passed one beautiful display of roses after another. There was a general air of enjoyment as visitors were met with yet another magnificent display. It has one of the leading old rose collections in the country and what I particularly liked was that each rose was labelled and also dated. Many went back hundreds of years. The atmosphere made you imagine what it must have been like to live in times when these magnificent roses had been discovered and propagated. It made the garden timeless too for me. Go as soon as you can - if we get wonderful hot weather the roses at Mottisfont will be over sooner than normal - don't miss them! Check out the current art exhibition before you leave. I've always found the art exhibitions well worth a visit, even on there own during winter months.